As the evolution of the DJ continues, so does the designs of Odyssey DJ coffins. Introducing the new REMIXER� GLIDE STYLE� SERIES DJ coffins featuring a full width glide platform to place all your DJ remix gear. With digital DJ software such as Serato, Traktor Scratch, and Ableton, more DJs have gone through the transition from beat mixing and scratching to full on remixing and producing. Availability of so many affordable remixing tools to the DJ, such as midi keyboards and controllers to laptops and iPADs, have grown to an ultimate high and Odyssey is there in the middle of it all providing these DJs the most functional DJ coffins yet with the REMIXER� GLIDE STYLE� SERIES. Our Glide Style� Coffins features our patented Laptop platforms that glide forward and backward over the mixer and players. 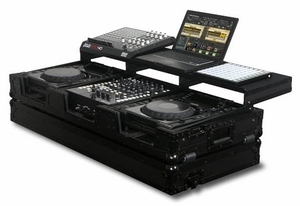 This model holds two large format tabletop CD/digital media players, one 10" width mixer, and enough platform space for your laptop, interface, hard drive, midi controllers and other DJ Remixer essentials. Other features include player/mixer ventilation pits that can also be used as storage compartments, rugged built-in corner roller wheels, heavy-duty spring loaded latches, stacking ball corners, and removable V-Cut� front access panels. Cabling is clean and easy through convenient access ports throughout. Large format CD/Digital Media player cases can hold: � American Audio Flex 100 MP3 � American Audio Radius 1000 � American Audio Radius 2000 � Amercan Audio Radius 3000 � Denon DN-S3500 � Denon DN-S3000 � Denon DN-S3700 � Denon DN-S5000 � Denon DN-S5500 � Denon DN-HS5500 � Gemini CDJ-600 � Gemini CDJ-202 � Gemini CDJ-203 � Gemini CDJ-210 � Numark NDX800 � Numark V7 � Pioneer DVJ-1000 � Pioneer CDJ-1000 � Pioneer CDJ-1000MK2 � Pioneer CDJ-1000MK3 � Pioneer CDJ-2000 � Pioneer CDJ-800MK2 � Pioneer CDJ-850 � Pioneer CDJ-900 � Stanton C.303 � Stanton C.313 � Stanton C.314 � Stanton C.324 � Technics SL-DZ1200 and more!